Let’s show you how we can find the right keywords and phrases, and create a strong content strategy. Free SEO audit of your site and your competitors. Manage Google Ads, Display and paid Social Media. Collect emails for you from your prospects. Outstanding design of your message and brand. Use pixels, tags, visibility, and automated marketing. This is just a sample of our digital tactics available. Find out more with a consultation. Contact us. Our clients get an effective, responsive website. They get at least three months of sustained and creative content. 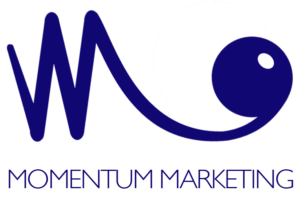 Momentum marketers share carefully-selected images. We create professionally-produced videos. Of course, we write great copy to engage your audiences and prospects. Furthermore, we assist you in developing the right message and campaign. We relieve the stress of managing social media profiles. Equally, we can expedite Search Engine Optimization on your site. GOOGLE/BING ADS – Paid search advertising is a way to drive more traffic to your site when people are looking for you – or for your competition. We make sure that your name comes up when people are searching for brand-ambiguous terms. GOOGLE BUSINESS LOCATION – Make sure your brand and messaging and contact information are clear and useful to your prospects when your business appears in a Google Location Search Result. It’s there – even if you’re not managing it. So, we’ll help you claim and control and use it for good. FACEBOOK BUSINESS PAGE – Whether you’re a B2B or B2C or nonprofit, your organization exists on Facebook, again – even if you’re not managing it. We’ll help you get control of your page. We can also utilize FB to accentuate SEO efforts, plus target your audience with boosted posts and paid ads. LINKEDIN COMPANY PROFILE – Your LI company page may not exist or may be dormant. This is an often-under-utilized tool which can help your SEO. Plus, in addition to HR recruiting, LI can be used to target specific audiences. VIDEO PRODUCTION – Video gives our eyes a rest from the overabundance of textual information we find online. It’s part of the reason audience-video engagement in 2018 is up to 78% every week, and 55% every day. Secondly, you can consistently keep a mix of high quality and more affordable production consistently in your promotion.